« I’m in Training. Glorious, Glorious Training. So, I’ve been in training this week. Yes, again. This particular week we are learning about PeopleSoft Billing and Accounts Receivable. Awesome, huh? I get goose-bumps just talking about it. Seriously, the atmosphere in this class is like the encore at a Lynard Skynard concert. They just started singing Free Bird, lighters are lit and raised, people are losing their minds. It’s almost a religious experience. Oh yeah, I’m completely lying, it’s as boring as last week. Since the class is so boring, Winn-Dixie is providing a jar of candy to keep us all buzzed on sugar. So not only am I losing consciousness due to lack of interest, I can also hear myself getting fatter eating fist fulls of chocolate trying to stay wake. Seeing as how I’m slowly being bored to death and fattened up by my company, I could just copy and paste last week’s article into this week’s article and be done with it. But you, my readers deserve better. I was approached recently by my mother-in-law to research and write an article about candy bars. I guess she and HER mother were discussing candy bars they remember from their childhood and wanted to know a little bit about their history and what was the first candy bar. I’ve done that research and the accompanying article is below. It’s fitting that I write this article while shoveling obscene amounts of miniature Hershey bars into my mouth. Enjoy. Chocolate itself has been enjoyed, as a drink, since the early 16th century. Montezuma, ruler of the Aztecs, the conquistador Cortez, and many of the royal families in Spain have enjoyed drinking chocolate as a beverage. It wasn’t until the mid-19th century in England that chocolate was consumed as a non-liquid confection. Actual bars of chocolate start showing up in the late 1800s. Candy shops would sell off chunks of excess chocolate from their store supplies in order to wring every last penny out of their inventory. At the 1893 Columbian Exhibition in Chicago, Milton Hershey would purchase his first chocolate making machinery (up to this point, he only made caramel) and set up shop in Lancaster, PA (later moved to Derry Church, PA). His first Hershey bars would show up a year or so later and get national distribution by the end of the century. This is not to say that other candy bars weren’t around by this point, but it is generally believed that the Hershey bar is the first and oldest still-produced chocolate bar in the world. Other American companies would mix in ingredients like peanuts, caramel, fruit, etc. through the start of 1900, but the chocolate bar wouldn’t really take off in popularity until after World War I. During WWI, the Army had chocolate manufacturers send 40 pound chocolate blocks that would then be cut into individual-sized bars and given to soldiers in Europe. After the war, when all the soldiers returned home, they had fond memories of those chocolate bars and started buying them. This caused a major boom in the chocolate industry and by the 1920s over 40,000 different chocolate bars could be bought across the country. That was essentially how the whole candy bar business was born. Let’s take a look at some of the more interesting trivia tidbits of these candy bars. In 1920, the Curtiss Candy Company started producing the Baby Ruth candy bar. Since that time, the origin of the bar’s name has been debated over and over. The official story is that Baby Ruth is named after the daughter of former President Grover Cleveland. Another story contends that the company was looking to capitalize on Babe Ruth’s popularity without paying royalties. Which is true? We may never know, BUT let’s look at some facts. Baby Ruth was introduced in 1920. Grover Cleveland’s last year of office was in 1897, 23 years prior. Grover’s daughter, Ruth, died at age 12, 16 years prior. Babe Ruth was traded from the Red Sox to the Yankees in 1920 and was coming into the height of his popularity. It may all be coincidence. Apparently Ruth Cleveland was born in-between Grover’s two terms in office and, at the time, was a national sensation. Why, though, it took 16 years to get a candy bar named after her, I don’t know. It’s also said that the bar was named after the granddaughter of one of the original formula’s developers. Since he was a nobody, the whole story was concocted as a marketing gimmick. That one is interesting too, but it’s all speculation at this point. An interesting footnote, in order to combat the mis-use of his nickname, Babe Ruth released a candy bar officially endorsed by him. Click here to see the wrapper. I’ve always enjoyed the “look” of the Zero bar (see pic). I don’t know if you’ve ever had one, but it looks cool, even if it tastes a little weird. I always wondered why they called it Zero. What’s zero? Calories? No. Fat? No. WHAT?! Well, if you look here you can see an early version of the Zero wrapper that shows the original idea was that it was a “cool” treat, as in “zero” degrees cool. Get it? Haha, that’s so dorky. 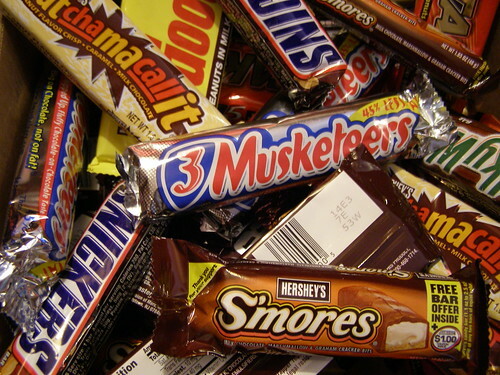 Did you know 3 Musketeers was originally three small candy bars in one package, hence the name? Also, each bar had a different flavor (chocolate, vanilla and strawberry). Interesting how that concept got lost, huh? Now, the 3 Musketeers bar is a flat taffy-like candy. WTF?! Well, class, that’s it for today. My information/research came mostly from Wikipedia and the National Confectioners Association website. Also check out The Candy Wrapper Museum and Mike’s Candy Wrapper Page for great images of some of your favorite candies and their packaging. All of those sites are very informative. Me, I gotta get back to acting like I’m not falling asleep. Oh, by the way, today is my friend Steve’s birthday. Let’s all wish the old sonova ‘B’ a happy one. HAPPY BIRTHDAY, STEVE!!! This entry was posted on February 9, 2007 at 9:00 am and is filed under candy, food, pop culture with tags candy, pop culture. You can follow any responses to this entry through the RSS 2.0 feed. You can leave a response, or trackback from your own site. Thanks, man. Glad you read multiple posts on this blog after deeming my “info” as “stinky”. Having been through PeopleSoft training- I absolutely feel your pain. You definitely made better use of your downtime than I did though. This was a fun read! An individual essentially help to make critically content articles I had condition. This can be the very first time I actually been to your internet web page and thus significantly? I actually amazed while using investigation you have made to generate this particular placed amazing. Great hobby!